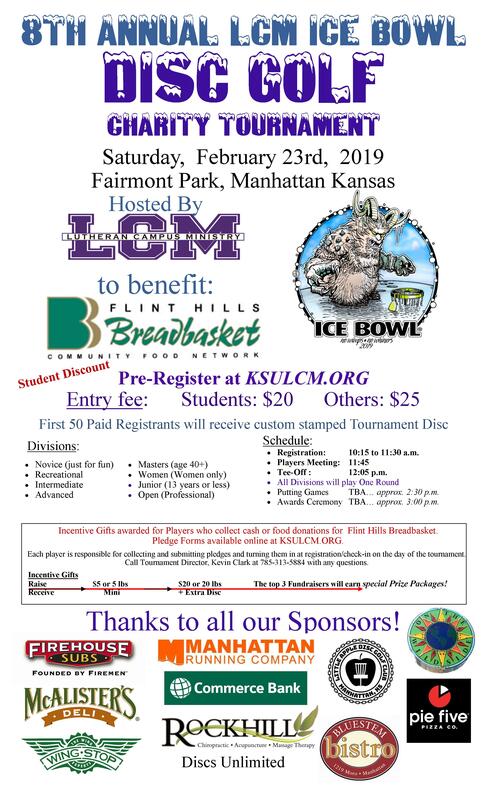 Welcome to the 2019 LCM Ice Bowl Information Page! Thanks to all of our Players, Donors and Volunteers, During the past eight years we have raised $3,199.75 and 2,992 pounds of food locally for the Flint Hills Breadbasket! To View the receipt from our 2019 DONATION to Flint Hills Breadbasket, Click Here. The 2019 Ice Bowl is now history. See you next year! Collecting pledges is not necessary in order to play in the tournament, however, only those who collect pledges will be eligible to receive incentive prizes. ($10 in pledges for a tournament mini, $30 in pledges for an additional tournament disc) The top 3 fundraisers will earn Special Prize Packages. To Download the Waiver/Entry Form, Click Here. The Waiver/Entry Form will be available on the day of the tournament, however, players under age 18 need to have a parent sign the waiver. Please bring your signed Waiver/Entry Form to the check-in table on the day of the tournament.